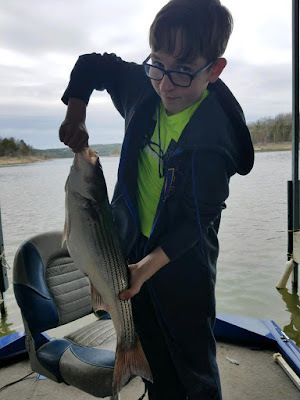 The beginning stages of Norfork Lake's spring fishing season have begun. It is a little behind prior years due to the continual unseasonable cool fronts, but it is coming. Forecasts for the next few days is great, but another cool front is possible later in the week. The bait fish are moving toward shallow water to get to warmer water, and the predators are following to feed. Shad will be going though a spawn very shortly. The cool fronts do affect the fish, but if you adjust a little and move out to a little deeper water you will find the feeding fish. I have had a very good week of fishing. Today was outstanding. I caught well over 30 fish this morning. 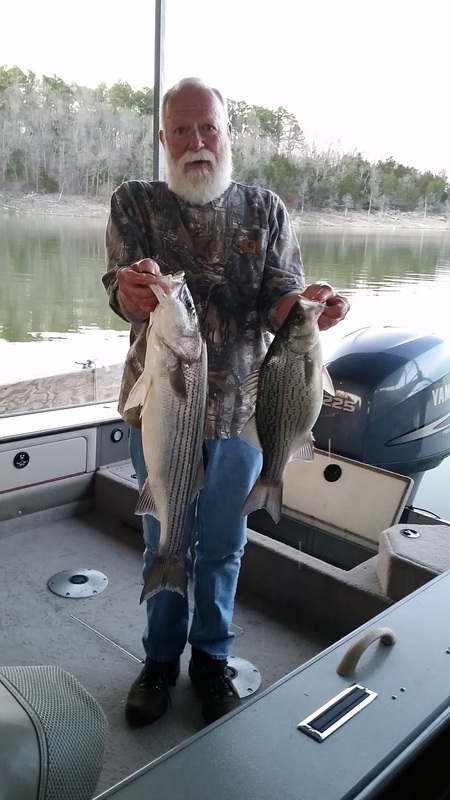 The majority were the monster 2.5 - 3.5 pound white bass. I caught one that went over 4 pounds. 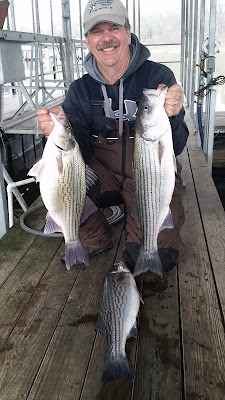 Mixed in with the whites were the medium sized hybrids going about 5 - 6 pounds. I ended up landing 5 hybrids. All of my fish were either released on site or at my dock after the photo op. I was finding fish on main lake points in 18 - 25 feet of water. 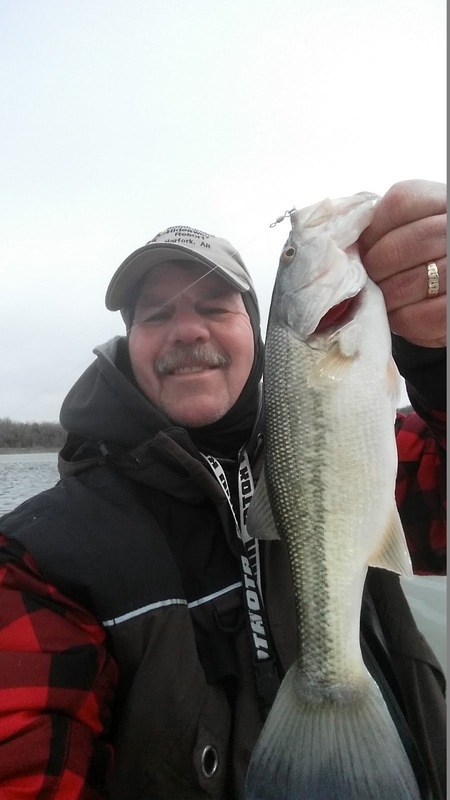 My method of fishing this morning was vertical jigging a 3/4 ounce white colored spoon. I was fishing northwest of Hummingbird Hideaway Resort's cove.The striped bass I have caught by either casting out a 5 inch swim bait with a 3/8 ounce jig head or with live bait. The stripers have been in 15 - 30 feet of water and suspended at all depths. 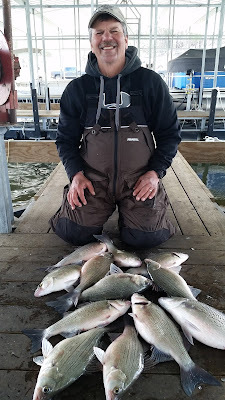 I have caught fish on down lines set at 15 and 20 feet, as well as with free swimming baits with a small split shot or no split shot. Most of the stripers are 8 - 12 pounds on the average. 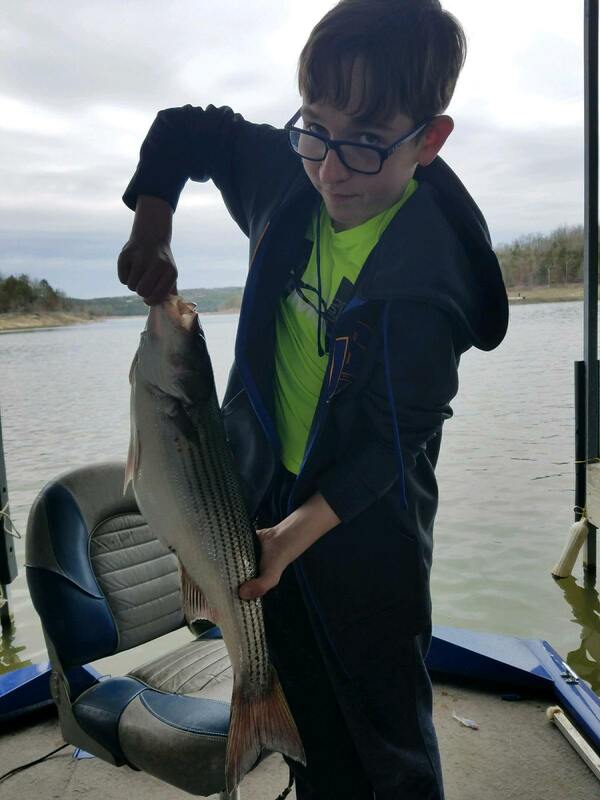 I am finding striped bass northeast of my resort. I would like to welcome all of the Bass Cat boat owners that are arriving to Mountain Home, AR to fish in the Bass Cat Owners Invitational Tournament. The warm weather forecast for the rest of the week should make for a great bass bite. Some of the larger bass had moved off of the shore, but will be returning very shortly. There are signs that some of the bass are starting to make their beds. Have a great tournament. Norfork Lake level is falling slowly with one generator running full time and spillways partially open, releasing enough of water to equal using a second generator. The current level is 559.74. The lake surface water temperature this morning on the main lake was 53.5 degrees and back in a creek was 55.5 degrees. These temperatures will be increasing though out the week. Most of the areas I fished this morning were a greenish stained.